Comment: In very good condition. Posted next day. Please check out my other items. It was all about the past, present, and future for Liverpool FC in 2014/15. The club said goodbye to one of its greatest ever players as Steven Gerrard brought an end to his glorious Liverpool FC career. There were emotional scenes as the man who captained Liverpool to an unforgettable UEFA Champions League triumph ten years ago played his final moments, and scored his final goals in the famous Red Shirt. 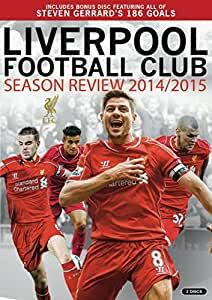 But as Gerrard said goodbye, Philippe Coutinho, Jordan Henderson and the latest generation gave Liverpool FC fans a clear indication that the future remains bright at Anfield. Special Gerrard tribute disc featuring all 186 goals scored by the captain in his 710 games for the club. 5.0 out of 5 starsLiverpool are KINGS!! Another fantastic piece of Liverpool history. Well done everyone involved in the make of this wonderful DVD. Arrived before expected. In cellophane wrapper.